The Double closely resembles a few other thrillers, but it is in ways which I cannot divulge without ruining some of the surprises the film has to offer. These are surprises which may be easily spotted by those who have seen these other films, but I will leave it up to the memory and film instinct of each individual viewer. Personally, I have seen far too many films for The Double to stick as anything entirely memorable, though I do remember being entertained as I watched the film. It may not leave a lasting impression, which is probably why few have heard of this film prior to home video release, but it still has an entertainment purpose. Part spy film and part serial killer thriller, The Double follows the investigation of a series of murders which begin with the assassination of a United States Senator. Each murder is a slit throat, which is thought to be the work of a political Soviet assassin known only Cassius. Many thought Cassius to be dead, including the ex-CIA agent who was once responsible for the investigation on his murders. Paul Shepherdson (Richard Gere) is called into the new investigation after the murder of the Senator, paired up with a young FBI agent named Ben Geary (Topher Grace), whose thesis was on Cassius. These two experts disagree on whether the new murders are Cassius or a copycat, but they must find a way to trust each other in order to put an end to the killing. There are many layers of the plot, with grander Russian schemes than the simple murders of Cassius. It is all rather complex and well thought out, however improbable a story like this may seem. 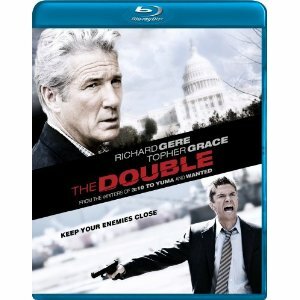 The Blu-ray release includes an audio commentary with co-filmmakers Michael Brandt and Derek Haas. Brandt directs and Haas produces, but both co-wrote the screenplay together as they have previously done with the successful 3:10 to Yuma and Wanted. Also included in the extras is a making of featurette and the trailer, which is below.